VAUXHALL / OPEL ENGINE MOUNT REAR. Compatible for the following vehicles. Astra G-MK4 (98-04) X12XE, Z12XE, X14XE, Z14XE, C16SEL, X16SZR, X16XEL Z16SE, Z16XE, Z16XEP, X18XE1, Z18XE, Z18XEL X20XER, X20XEV, Z22SE, Z16YNG, X17DTL, Y17DT, Z17DTL. Z12XEP, Z14XEL, Z14XEP, Z16XE1, Z16XEP, Z16XER Z18XE, Z18XER, Z13DTH. Z16SE, Z16YNG, X17DTL, Y17DT, Z17DTL Zafira B-MK2 (05-12). Visit our shop for more parts. 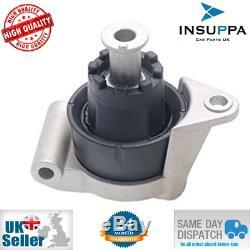 The item "VAUXHALL/OPEL ASTRA G H MK4 MK5 ZAFIRA A B REAR ENGINE MOUNT DAMPER GEARBOX" is in sale since Friday, June 9, 2017. This item is in the category "Vehicle Parts & Accessories\Car Parts\Engines & Engine Parts\Engine Mounts". The seller is "insuppa-trading" and is located in Bournemouth, Dorset. This item can be shipped to United Kingdom.